quality versus quantity does not have to be a winner-take-all proposition. Shake with crushed ice and pour into tall glasses. Float 1 oz dark 151 proof rum (Lemon Hart). After Yacht Rock Sundays at Loyal Nine, I ventured home and made myself a post-shift drink. In reaching for Beachbum Berry's Remixed, I got drawn into the section of Zombie variations, and the one that called out to me was from the South Seas Restaurant in Honolulu circa 1970. I am pretty sure that it was the call for sweet vermouth à la the Floridita Daiquiri that caught my attention and curiosity. 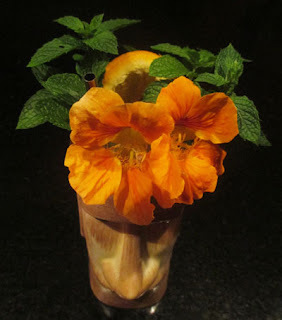 In the Tiki mug, it offered a fruit spice and mint bouquet. Next, lemon, orange, pineapple, and caramel on the sip gave way to dark funky rums on the swallow. Vermouth in tiki? Always a winner! The euphemisms are getting a bit stale, suffice to say: four people in Boston -- two of whom are much more prolific writers than the other two (including the originator of this blog, who has no excuse apart from laziness) -- who drink and tell. The 2017 collection of 855 drink recipes, bartender tributes, and essays on hospitality from CocktailVirgin's Frederic Yarm. Available at Barnes and Noble and Amazon. The 2012 collection of 505 drink recipes, techniques, and Boston bar recommendations from Frederic Yarm. Available at Amazon and Barnes and Noble.